The XV Arica y Parinacota Region (Spaingie: XV Región de Arica y Parinacota) is ane o Chile's 15 regions. It borders Peru tae the north, Bolivie tae the east an Chile's Tarapacá Region tae the sooth. It is the kintra's newest region an aw, creatit unner Law 20.175. It became operational on 8 October 2007. Chile's umwhile Tarapacá region wis a umwhile Peruvian province, which wis occupeed bi Chile unner the 1883 Treaty o Ancón at the close o the War o the Paceefic, an then formally annexed in 1929 bi the Treaty o Lima. In 2007, the region wis subdividit tae create the Arica an Parinacota region an the present day Tarapacá Region tae the sooth. The region is further subdividit intae twa provinces: Arica an Parinacota. Accordin tae data frae the 2002 Census o INE, the region is populatit bi 189,644 indwallers. Its densitie reaches 11.2 indwallers per km ². This region haulds the lairgest population o indigenous fowks o Chile: the Quechua, Aymara, Atacameno, Diaguita, Mapuche an Kaweskar (Alacaluf or Qwakshar) transplantit frae Central Chile. A significant nummer o immigrants frae neeehbourin Peru, Bolivie, Ecuador an Colombie. Includit are those o Asie strynd, such as Cheenese an Japanese; an Arabs frae Lebanon, Palestine an Sirie. Maist o the kintra's Afro-Chileans live in the Arica province, descendit frae slaves in the 17t an 18t centuries. Thare are a lairge nummer o Roma fowk or Gypsies in the Arica province as well, oreeginatit frae Eastren Europe in the late 19t century. At the level o ceeties, the maist populatit are: Arica, wi 175,441 indwallers an Putre, wi 1235 indwallers. The region lies athin the Norte Grande (Far North) naitural region. It combines deserts, green valleys, the steep an volcanic Andes muntains, an the Altiplano (heich plain) tae the east. A narrae coastal strip o law-lyin land nae mair nor 2 kilometres (1 mi) wide separates the Paceefic's Nazca plate frae the Andes. 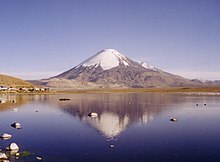 Its Parinacota volcano is the region's heichest elevation at 6,348 metres (20,827 ft) an lees on the northren border wi Bolivie in Lauca Naitional Pairk. The region's twa main rivers are the Lauca, which drains intae Bolivie's Coipasa salt flat (Lago Coipasa), an the Lluta, which flows intae the Paceefic Ocean. Lake Chungará at 4,517 metres (14,820 ft) abuin sea level ranks as ane o the heichest in the warld. A desert climate dominates the region. Near the coast, cloudiness can leemit the temperatur swing throughoot the day, but in ither drier auries, temperaturs can vary greatly as is teepical in deserts. A marginal desert region can be foond ower 3,000 m (9,843 ft) abuin sea level, which sees milder temperaturs an simmer rains. On 26 Januar 2007, Peru’s govrenment issued a protest against Chile’s demarcation o the coastal frontier the twa kintras share. Accordin tae the Peruvian Foreign Meenistry, the Chilean legislaturs haed endorsed a plan regardin the Arica an Parinacota region which did no comply wi the current established territorial demarcation. Mairower, it is allegit that the proposed Chilean law includit an assertion o sovereignty ower 19,000 m2 (204,514 sq ft) o land in Peru's Tacna Region. Accordin tae the Peruvian Foreign Ministry, Chile haes defined a new region "athoot respectin the Concordia demarcation." For its pairt, the Chilean govrenment haes assertit that the region in dispute is no a coastal steid namit Concordia, but instead refers tae boondary stane No. 1, which is locatit tae the northeast an 200 meters inland. A possible border dispute wis avertit when the Chilean Constitutional Court formally ruled on 26 Januar 2007 against the legislation. While greein wi the court's rulin, the Chilean govrenment reiteratit its stance that the maritime borders atween the twa naitions wur no in quaisten an hae been formally recognizit bi the internaitional commonty. . The Peruvian govrenment haes statit that it micht turn tae the internaitional court at The Hague tae solve the dispute. ↑ 1.0 1.1 1.2 1.3 1.4 "Arica-Parinacota Region". Government of Chile Foreign Investment Committee. Retrieved 13 March 2010. ↑ 2.0 2.1 "Peru protests against Chile's new definition of territory". Xinhua People’s Daily online. Retrieved 27 January 2007. ↑ "Peru-Chile Sea Dispute May Go to The Hague". Lima: Prensa Latina. 27 January 2007. Retrieved 28 January 2007. This page wis last eeditit on 5 Mairch 2018, at 07:37.